Read the Patient Information Leaflet if available from your pharmacist before you start taking anastrozole and each time you get a refill. If you have any questions, ask your doctor or pharmacist. Take this medication by mouth with or without food as directed by your doctor, usually once a day. What conditions does Arimidex treat? Tell your doctor right away if you have any serious side effects, including: bone pain, easily broken bones, joint stiffness/pain, muscle pain/stiffness, mental/mood changes (such as depression), numb/tingling skin, swelling hands/ankle/feet, shortness of breath, unusual vaginal discharge/bleeding/burning/itching/odor, pain/redness/swelling of arms or legs, vision changes, signs of liver disease (such as nausea/vomiting that doesn't stop, stomach/abdominal pain, yellowing eyes/skin, dark urine). Get medical help right away if you have any very serious side effects, including: chest/jaw/left arm pain, confusion, trouble speaking, weakness on one side of the body. List Arimidex side effects by likelihood and severity. Before taking anastrozole, tell your doctor or pharmacist if you are allergic to it; or if you have any other allergies. This product may contain inactive ingredients, which can cause allergic reactions or other problems. Talk to your pharmacist for more details. Before using this medication, tell your doctor or pharmacist your medical history, especially of: heart disease (such as history of heart attack), bone loss (osteoporosis), liver disease, high blood pressure, blood clots. Anastrozole is used mainly in women after menopause. If you have not gone through menopause, this medication must not be used during pregnancy. It may harm an unborn baby. Discuss the use of reliable forms of birth control (such as latex condoms) with your doctor. Products containing estrogen (such as birth control pills) should not be used. If you become pregnant or think you may be pregnant, tell your doctor right away. What should I know regarding pregnancy, nursing and administering Arimidex to children or the elderly? Some products that may interact with this drug are: estrogens, tamoxifen. Does Arimidex interact with other medications? Lab and/or medical tests (such as cholesterol levels, liver function, bone density) should be done while you are taking this medication. Keep all medical and lab appointments. Consult your doctor for more details. 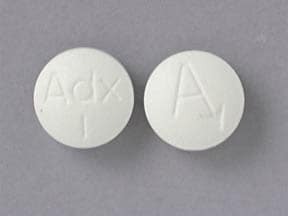 This medicine is a white, round, film-coated, tablet imprinted with "A" and "Adx 1". Are you considering switching to Arimidex? How long have you been taking Arimidex?